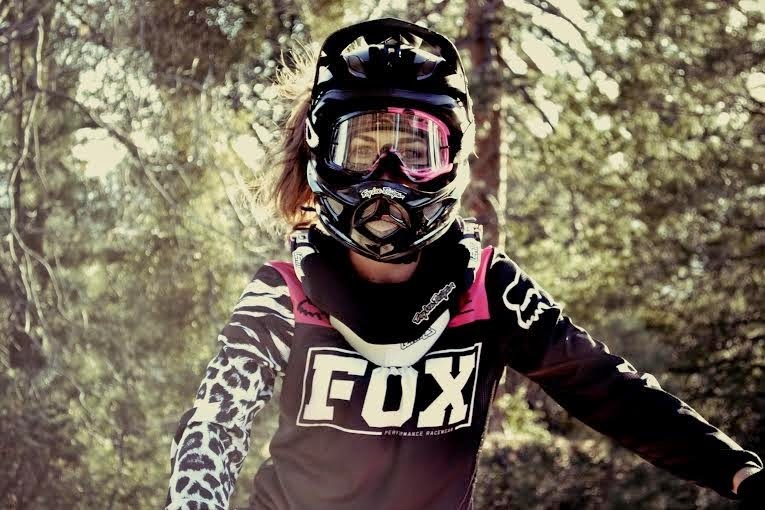 Meet Christine Eikmeier who is a pro DH racer. I'm pretty sure I saw her interview on MTB4Her and thought "She sounds awesome!" Plus? When you go by Johnny Ringo, how can you not feel that the cool factor wasn't upped a few notches? I was so excited when I got the response saying Christine would be up for an email interview. What she does out there is probably far beyond what I will ever do with mountain biking-it's amazing! She's a women breaking boundaries and having fun doing something she's passionate about. Passion can drive people to do great things, and in a male-dominated sport we need more women need to bust down those walls. I started riding when I was around 4 years old. My mom has been riding all her life, so it was important to her that I learn. Today, my mom and sister are my riding partners. We ride all mountain 3-4 days a week. Like most kids, she started me off on a cheap, heavy hard tail, which now looking back, greatly helped my skills. If you can do difficult things without suspension, you can fly over it when you finally have full suspension! In February 2013, I bought my first downhill bike and fell in love with the sport! The accomplishment of a hard workout! I love the joy and feeling of achievement that biking brings to me. It’s similar to “the runner’s high”, the feeling that you get pushing your limits and seeing how hard you can ride. Exploring new trails, staying fit, tackling new challenges, and overcoming my fears is my drive for pedaling. This is my second year of racing downhill now. I compete for enjoyment and excitement. I am currently building a carbon trail bike to use for the “trail” downhill courses and would like to try some enduro races. I also love to travel, see new places, and ride new areas. One of my goals is to race and travel more in other states. Definitely downhill! I love the adrenaline and excitement of going fast and accomplishing what I think at first sight to be impossible. As a woman, yes the sport is highly intimidating, but it brings me joy and a sense of accomplishment knowing I didn’t let my fears conquer me. Would being a woman be the main reason why you chose to do downhill? Is it the concept that you are one of a few who do it? I know downhilling is primarily a man dominated sport, but it doesn't mean us ladies can't join in the fun and shred too! I find riding with the guys makes things fun and interesting. They are always encouraging me and helping me out, pushing me to progress in my skills. I chose to downhill simply because I love the adrenaline and excitement of riding fast. How do you feel you benefited from learning MTB at a young age vs. coming into it in your later years? Usually when I fall, I can easily get back up and hop back on my bike. Yes, being young does greatly help in the way that my body can handle crashes a lot easier. It doesn't mean that age has to keep one from riding! I hope my bike can always be a huge part of my life, even when I am in my later years of life. It is a great way to stay in shape and enjoy life to the fullest! I was grunting, tired, hot, pushing my bike up a steep, long hill, and six years old. Haha My mom took me on a shorter version of the 24 Hours of Adrenaline race course in southern California. 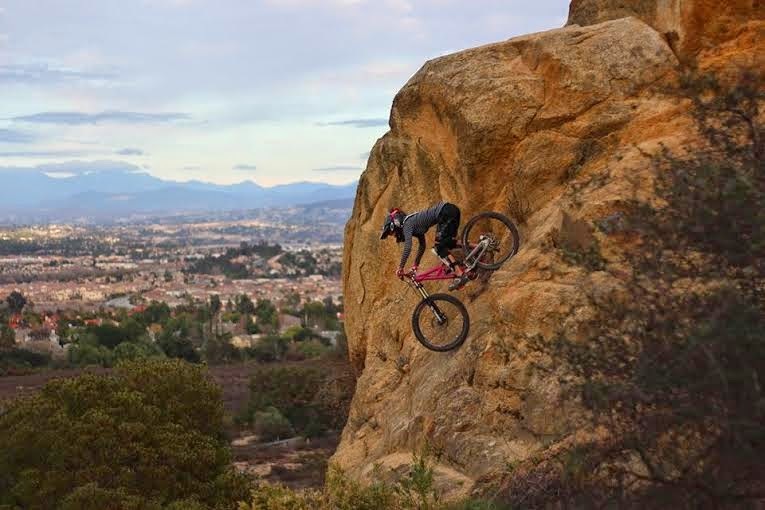 I’m glad she introduced me to mountain biking at an early age, and today….I’m hooked! I can’t go a week without riding my bike. Just ride! Ride it out. I get pre-race jitters almost every race, but over time, I have learned to go with it and use the adrenaline for my benefit. Also, riding with the guys always helps me! They help boost my confidence and give me the extra strength when I most need it. I ride clipless for all mountain, but ride flats for downhill. The benefits of riding clipless are worth it! Your pedal power is so much more powerful. My suggestions is: practice, practice, practice! Practice unclipping until it is an unconscious, easy, and fast action. Where was this at and do you remember how you felt while riding down that rock? My friends and I were riding some downhill trails when I noticed this boulder. My first thought was, "I want to roll down that!" I asked the guys if it was possible and they said it was, but it is super steep. So we took on the challenge and shimmied up the rock. Looking down the boulder, gave me a slightly nervous stomach. I knew it was extremely steep since you couldn't see over the edge until you were at the very tip of the rock. I'll admit, I was a bit nervous, especially after one of my buddies started getting anxious. But after I watched him ride down, I was eager to follow. It's one of those things you just have to examine and go for it before you build up too much fear. The joy and sense of accomplishment after riding down the rock was awesome! I was so excited that I rode down it! During a two run downhill race format, I made some mistakes during my first course run. Frustrated and wanting to better my time, I pushed even harder and threw in more pedal strokes around every corner. I entered into a sticky rock garden way to fast and ended up going over the bars. All I remember was smashing into a rock with my full face helmet, and having my bike hit me and land on top of me. Out of breath from pushing my limits, the next thing I knew was something was pulling on my Leatt and dragging me by my neck. I couldn’t breathe from my Leatt cutting off my air supply on my throat! Having a 40 pound bike on top of me and laying on the ground in my position, I struggled to get the bike off of me. I panicked, gasping for air and attempting to pull my Leatt off, but I couldn’t. Fortunately, some spectators assisted in pulling the bike off of me. I was shook up but luckily no broken bones. I had a concussion, but filled with determination, my first though was, “I’m not going to get a DNF on my race result!” I picked my bike back up and began to make it down the mountain, only to notice seeing past my tear filled eyes, crooked handle bars and a pebble bouncing around in my goggles. I made it down the mountain and finished my race. Yes, I was in pain, but at the moment my mind disregarded it from the adrenaline. After a good fall, my motto is always to get back on if possible. This way, you end on a positive note instead of letting fear overtake you. The adventures that come with riding! I love riding with friends, meeting new people, and exploring new trails. Something interesting always happens out on the trail; whether it be taking a new drop on my downhill bike, powering up a steep hill, surviving a crazy crash through a rock garden, or running into a rattle snake! Each and every ride yields a story. I also love how my bike pushes my limits and encourages me to try something new every ride. What is something neat that not everyone may know about you? I love to dance and cook! Usually people that I first meet can't tell that I am a mountain biker, but my cuts, bruises, and scars show my passion. Where do you think you would be if you hadn't discovered the bicycle? My bike garage would be a barn and I would be riding my horses! Rodeo girl and show jumper right here!